IHMSA15151 - Brian Enos's Forums... Maku mozo! The TK Double-Kross mags are helpful in getting them to drop if you only use the one side. The loaded side below is heavier and will help it drop out easier. I have a Techwell on my PSA lower and it has been great. Another vote for the Pocket Pro II. Be sure and set the sensitivity towards the "cowboy" end of the range and you'll be fine. This is true. Also, I don't find much recoil difference from my major loads and minor Steel loads. They certainly feel different, but not to the point of being painful. Another vote for the Armageddon sling. You might not use it a whole lot, but when you do need one you want it to work well and adjust easily. I don't shoot irons much anymore as my eyes aren't what they use to be, but when I do, I go "Old School" with my Volquartsen Lightweight Mark III. I have a friend who's a sponsored steel shooter. He just got one a little while ago and seems to really like it. He's on Facebook and I am sure he would be glad to give you some feedback and answer any questions if you contact him there. His name is Trenton Mitsuoka, super nice guy. I have several of the older ones and have had zero issues. Just picked up 2 of the newest ones. I've only run maybe 500 rds. through them but so far they run great. I run one of John Allchin's comps and they work great for the issue you are posting about. I mounted it with the ports pointed to the sides of the barrel. One important thing to remember is to remove your comp now and then and clean the muzzle crown. When we had the 22 ammo shortage I ran a lot of non-plated lead ammo and the crown got enough build up on it to deflect a bullet. The exit hole on my comp now looks like a figure eight. LAX Ammunition is have a $15 lower receiver sale starting at noon Pacific Time today. The Hi-Viz magnetic one is a channel shape that goes over the rib. There's no way it's rotating. I've had it 3 yrs. and shot hundreds of rounds, birdshot, buckshot and slugs, hasn't come off yet. You are correct. The Brimstone and Kidd top end triggers are more geared to benchrest shooting or silhouettes shot offhand. For the steel game I believe they are a bit too light and could result in some AD's if you're not real careful. 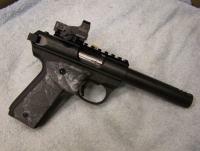 I run a FF3 on my Open Class 3Gun pistol. It has held up very well and as Kixx pointed out, the window size really becomes irrelevant if you practice enough with it and the dot is in the right place when you bring the gun up. I use the Hi-Viz magnetic sight. Attaches right over top your original bead. It stays in place and is really bright.